To celebrate winter, I made one tube sock snowman for myself and some for my mom. I was able to buy everything I needed from the dollar store except the googly eyes. I used play dough for each of my sock snowmen's carrot noses. 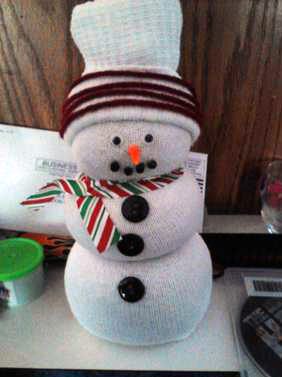 Here's a picture of the sock snowman I made for myself. Your sock snowman is very cute! Thank you for sharing him with us. I like his hat. His black charcoal eyes, mouth and orange clay nose turned out great! I love how no two sock snowmen will ever be exactly the same. They are always unique in one way or another.